Notice anything peculiar about her eyes? 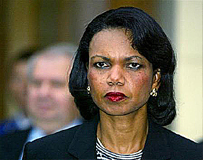 No, Condi isn’t possessed; the photo was manipulated. Ask USA Today’s Graphics and Photos Managing Editor, Richard Curtis (rcurtis@usatoday.com), what the ^$%#@+! is going on. I’ve emailed Mr. Curtis for comment and will let you know if I hear back. Mike’s Noise compiles the MSM’s scary Bush administration photo album. Bob Owens at Confederate Yankee weighs in on photo ethics. Scott Johnson at Power Line is reminded of Damien Omen II. Independent Sources is reminded of someone else. Yikes. Also has a round-up. La Shawn Barber wondered what was up with scary Condi two days ago. Roland at Steel City Cowboy defends USA Today. The Hannity.com reader forum discussed the photo alterations last week here. It looks like what they did was use a Photoshop filter called ‘unsharp mask.’It refers to an old photograph technique of offsetting negatives (or something like that) to emphasize the edges between colors or shades. newspaper or some other fuzzy format. unsharp mask happening, this was definitely a ‘willful’ professional job. I’ve forwarded Pete’s e-mail to Mr. Curtis and will let you know if I hear back. [Here is] the “real Condi” photo with “Unsharp Mask” applied globally. Note all details are sharpened. The eyes were masked in the USA today photo. Colors in the photo were saturated globally, but the eyes got special treatment. My first degree was an AA from the Colorado Institute of Art, and I have been using Photoshop for 10 years. That photo of Condi was deliberately manipulated. One of your readers (Pete) suggested that it may have been the result of misuse of the Unsharp Mask filter. Not so. I copied the real photo of Condi to my desktop and put it through several iterations of the Unsharp Mask filter in Photoshop 5.5. No matter how absurd I made the settings (300%, 7 pixel radius, 1 pixel threshold), I could not duplicate what was done. I wanted to comment on the reader who suggested the photo was the result of improper use of the unsharp mask filter. Not. This filter is used on all digital images to correct inevitable fuzziness, but there’s no way it could produce the eyes in the doctored shot. No, to arrive at the published photo, someone had to go into the image, select the pixels in the whites of her eyes and make those pixels REALLY white. Stupid and deliberate, without doubt! I’m a feature film visual effects artist out here in Los Angeles. I work for a major visual effects studio, and have worked on a whole lot of major blockbuster movies which you have undoubtedly seen. I have almost 10 years of professional experience at digital image manipulation. As others have said, this is definitely not an unsharpen filter, because only the eyes have been altered. And even so, if you isolated the eye areas with a mask and ran that filter you still wouldn’t get the result shown in the USA Today image. Not only is this an obvious attempt to give Condi “demon eyes,” it isn’t even a *good* attempt. If I assigned one of my artists to create a demon eyes effect for one of my films and that was what they turned in, I’d fire them. It looks like something a high school student would turn in. I doubt the photographer in question delivered the photograph in this altered state, simply because I imagine a professional photographer could do a better job. The whites of eyes aren’t solid white like white paint, they have subtle gradations, and a photographer would know that. Any manipulation by a photographer would include these gradations, not a simple black-and-white fill paint job. It wouldn’t surprise me if this was something someone doing layout at the paper thought they would sneak in. Simply despicable, no matter how you look at it. Unbelievable. Robert George points to another example of malicious photoshopping of a black Republican official. A lot of readers and bloggers like Jeff Miller are reminded of Goa’uld. Your tax dollars at work, splitting atoms in Saudi Arabia. PLUS: France is building reactors for Algeria and Libya.